• Figure 3. SHIRPA tools. A. 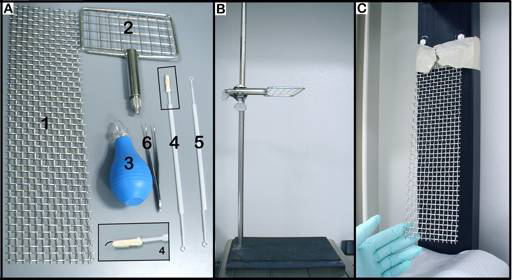 1) vertical woven grid (30 x 8 cm; wire ~0.050" gauge), 2) horizontal woven grid (30 x 8 cm; wire ~0.050" gauge), 3) rubber bulb, 4 & 5) plastic probes, 6) curve tweezers; B. stand with horizontal grid; C. holding board with vertical grid. • Figure 4. A. The 4-lane accelerating rotarod; B. Each lane is equipped with a built-in automatic timer; C. The speed of the rotating rod is adjusted manually. • Figure 5. A. The Chatillon-Ametek Digital Force Gauge, DFIS 2, system; B. The triangular metal transducer (8 x 8 x 8 cm; ~0.0625" gauge wire) is situated 25 cm above an insulated platform; C. The Force Gauge digital display. Grip-strength transducer: Chatillon-Ametek digital Force Gauge model DFIS 2 (Columbus Instruments, Columbus, OH). Cleaning supplies: paper towels, 70% alcohol, Sporocidin. Masking tape: for securing vertical wire-mesh and tail weights. Mice are allowed to acclimate to animal room over the weekend. The SHIRPA primary behavioral screen provides a behavioral and functional profile by observational assessment of mice. (SHIRPA was first described by Rogers et al. (1977) and stands for: SmithKline Beecham, Harwell, Imperial College School of Medicine, Royal London Hospital, Phenotype, Assessment.) This screen has been modified and evaluates gait or posture, motor control and coordination, changes in excitability and aggression, salivation, lacrimation, piloerection, defecation, and muscle tone. All parameters are scored to enable comparison of results both over time and between different laboratories. 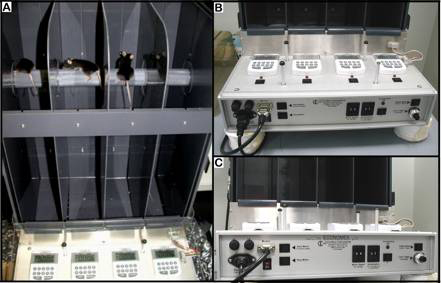 Mice are assessed for various behaviors as described below in a view jar, observation arena, horizontal and vertical grids, as well as during tail suspension and supine restraint. Set-up View Jar (2 L Pyrex beaker), Observation Arena (wean cage), Horizontal and vertical grids. All equipment is arranged in the same order for each test. The entire test area, including Arena, View Jar, and Grids are wiped down with ethanol and allowed to dry completely before the beginning of each test. a. 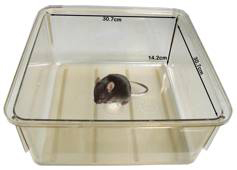 A mouse is placed in the View Jar for 30s, and observed and scored for body position, spontaneous activity, tremor, twitches, defecation, and urination (see Figure 1, Table 1). b. The mouse is then removed from View-Jar and placed in the viewing Arena by tipping the jar and allowing the mouse to drop into the wean cage. c. While transferring, the mouse is evaluated and scored for transfer arousal. In the Arena, the mouse is evaluated for palpebral closing, piloerection, startle response, gait, pelvic elevation, tail elevation, hindlimb splay, touch escape, finger approach, positional passivity, defecation, and urination (see Figure 2, Table 2). A fear assessment is made based on the overall response in the arena. The mouse is then handled sequentially for eliciting a response (called positional passivity) while transferring to the next test. d. Next, the mouse is suspended via its tail and moved from the Arena to the horizontal wire-grid. e. While descending toward the grid, the mouse is evaluated and scored for visual placement (see Figure 3A, Table 3). f. Once the mouse is has on all four limbs on the grid, it is evaluated for body tone, pinna reflex, corneal reflex, withdrawal reflex, and crossed extensor reflex (see Figure 3 A4, Table 3). g. Subsequently, from a standing position the mouse is held by tail suspension for 15 s.
h. While in mid-air the mouse is assessed for hind-limb splay, trunk-curl, and limb-grasp (see Table 4). i. After being suspended the mouse is lowered via its tail again towards the horizontal wire-grid. Once the mouse has grasped the wire with its forelimbs (only) it is rotated horizontally by the tail. j. The ability of the mouse to maneuver and to negotiate its position in the horizontal wire platform is scored based on hindlimb response (see Figure 3B, Table 5). k. Next, the mouse is handled and placed in a supine restraint, along its cervical-thoracic dorsa skin and gently scuffed. l. While securely restrained in a recumbent position, the mouse is further evaluated for skin color, limb tone, abdominal tone, lacrimation, salivation, biting, irritability, provoked biting, irritability, aggression, and vocalization (see Table 6). m. The mouse is kept recumbent or in supine restraint for the examination of its righting reflex (see Table 7). 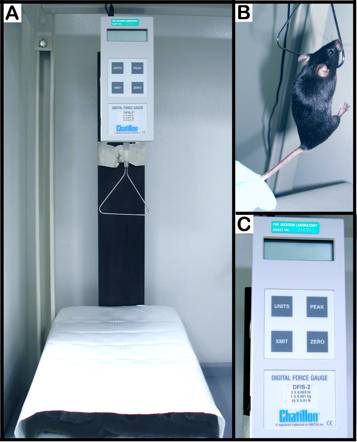 n. Then the mouse is placed on a vertical wire-grid with its head upward, then downward, and evaluated and scored for catalepsy and negative geotaxis (see Figure 3C, Table 8). o. The mouse is returned to its home-cage. p. All equipment is cleaned with ethanol and allowed to evaporate completely. 1. Mice are placed on a rod 3.5 cm in diameter, which is situated 40 cm above a foam platform. 2. Four mice are tested simultaneously, with each mouse being separated from the next by a 30 cm wide x 60 cm high opaque Plexiglas wall. 3. The mice are initially acclimated to the instrument by being placed on the stationary rod for three consecutive trials with a 1 min limit. a. Place each mouse onto a pad in each corral (4 mice can be tested simultaneously). b. Then place each mouse, facing towards the back wall of the Rotarod. c. While on the stationary rod, start the timers located in front of each corral. d. Time each mouse for 1 min and record latency to fall in seconds. • If mouse stays on for complete minute, record this time as 60 s.
• If mouse falls off before 2 s, re-start the trial. • If mouse repeatedly falls off rod before 2 s, record this as latency to fall. • If mouse has fallen from rod but hanging on to wall, count as a fall and record time mouse began hanging from wall. e. Replace mice on the Rotarod when they fall, facing towards the back wall of the Rotarod. f. Mice are removed off the Rotarod after 60 s during each stationary trial. • Observe and note any behaviors just prior to the fall: such as grooming, exploring, turning around on the Rotarod, hanging on to the Rotarod. g. Time each mouse for a total of 3 trials, 1 min per trial on stationary rod. h. Mice are removed from the Rotarod before moving on to the constant speed trials. 4. Each mouse is then replaced onto the rod at a constant speed of 4 rpm for three consecutive trials- each trial is limited to 1 min. a. Make sure motor speed is set to 4.0 rpm. b. Press the "start motor" button. c. Place all mice on the moving Rotarod facing towards back wall of the Rotarod. d. Once each mouse is on the moving Rotarod, immediately start the individual timer. e. Allow each mouse to run for 1 min and record latency to fall in seconds. • If a mouse stays on for 1 min, record this time as 60 s.
• If a mouse falls off before 2 s, re-start the trial. • Mouse may also hang on to the rod and rotate with the rod, count as a fall if mouse is not actively walking with the rotating rod and record and note this behavior. f. Following a fall, replace mice on the Rotarod facing towards back wall of the Rotarod. g. The mice are removed off the Rotarod after 60 s of constant speed trial. • Observe and note any behaviors just prior to the fall: such as grooming, exploring, turning around on rod. h. Time each mouse for a total of 3 trials, 1 min per trial at 4 rpm constant speed. i. Each mouse is removed from the moving Rotarod before moving on to the accelerating speed trials. 5. Finally, to measure balance performance, the mice are re-positioned on the rod, starting at a constant speed of 4 rpm, with an acceleration of 1 rpm/s over a 1 min period, and ending at about 64 rpm for three successive trials. 6. Latency to fall is recorded for each trial. a. Keep motor speed at a constant speed of 0.1 rpm. b. Place all mice on the moving Rotarod facing towards back the wall of the Rotarod. c. When all mice are in correct position, start the "acceleration" button. d. Press the "global reset" button to start all timers simultaneously. e. Allow each mouse to run for a maximum of 5 min and record latency to fall in seconds. • If a mouse repeatedly falls off rod before 2 s, record this as latency to fall. • Mouse may also hang on to the rod and rotate with the rod, count as a fall if mouse is not actively walking with the rotating rod. f. "Stop motor" after each 5-min/trial. • Rod, walls, and pads should be wiped down with ethanol in between subjects, making sure no residue is left on the rod. • Upon test completion, replace the plastic wrap around pads wipe equipment down with Sporocidin. • Wipe off excess Sporicidin with a wet cloth. The Chatillon-Ametek Digital Force Gauge, DFIS 2 is used to determine the strength exerted by the forelimbs of a mouse. 1) Turn Grip Meter "ON". 3) Zero (tare) grip meter prior to each measurement (<0.005 kg). 4) The grip-strength meter is positioned vertically, with the triangular metal transducer situated 25 cm above a foam platform. a. The mouse is then raised toward the triangular transducer and it instinctively grasps for the bar. c. Care is taken to ensure the mouse is holding the grip transducer properly, with and only with both front paws. d. Once an appropriate grip is assumed, the mouse is released and peak force is measured in kg. e. Three consecutive trials are performed and the mean peak tension and the maximum peak tension over 3 trials are recorded for each mouse. • Rotarod performance: latency to fall from stationary (habituation period), constant 4 rpm speed, and accelerating (0.1 rpm/s) speed.